The garage is probably the most cluttered and least organized space in the house and that’s because nobody really focuses enough on this area or on the furniture and features in it. 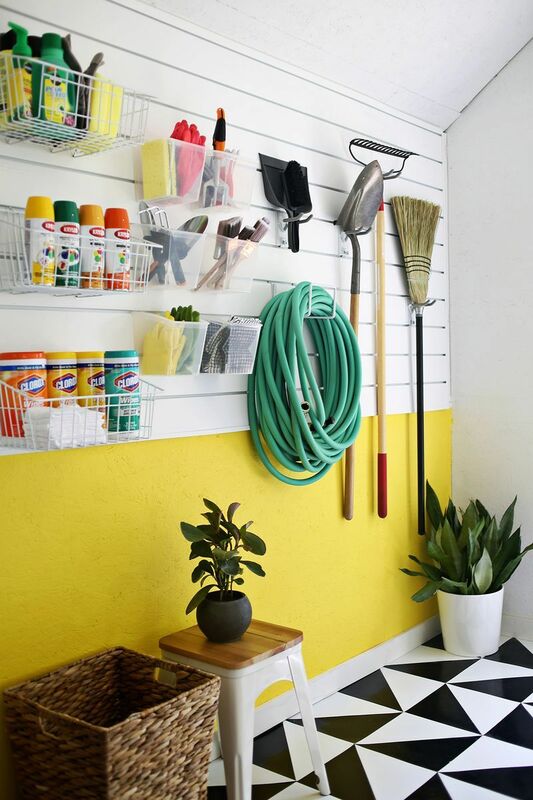 Sure, other spaces have priority but a good garage organization system can actually help you keep the rest of the house clean and tidy so isn’t it about time you focused your attention on DIY garage storage project? We have some ideas that you might find interesting. We’ll start with some shelves which are great for storing off-season shoes. Why clutter your entryway when you can keep everything you’re not using in the garage? 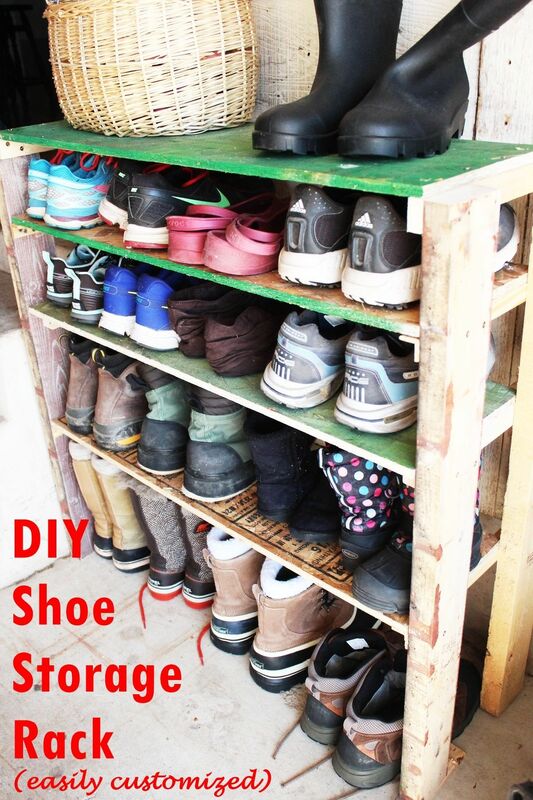 You can make these shoe storage shelves out of some scrap pieces of wood so it shouldn’t be an expensive project. Shelves are great for storing a lot of things on them, not just shoes and there’s definitely a lot to be stored in a garage. These fast and easy built-in wall shelves should help you keep the clutter at bay, at least a little. 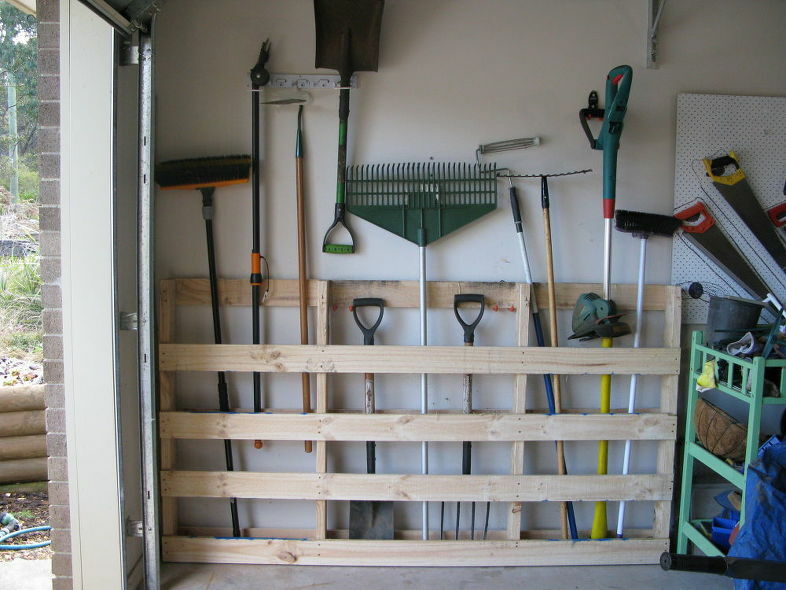 Garden tools and supplies are among the things we usually keep in the garage so it would be nice to have a separate storage unit just for them. It doesn’t have to be anything too complex. 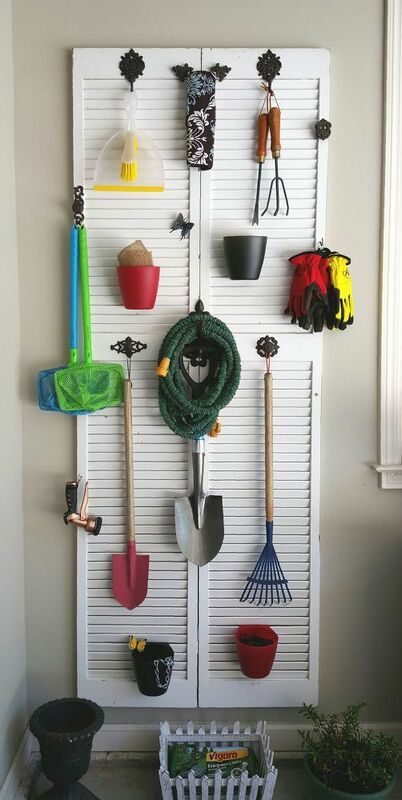 If you have some old shutters maybe you can repurpose those. Just add a few hooks and knobs and that should work just fine, as you can see on hometalk. 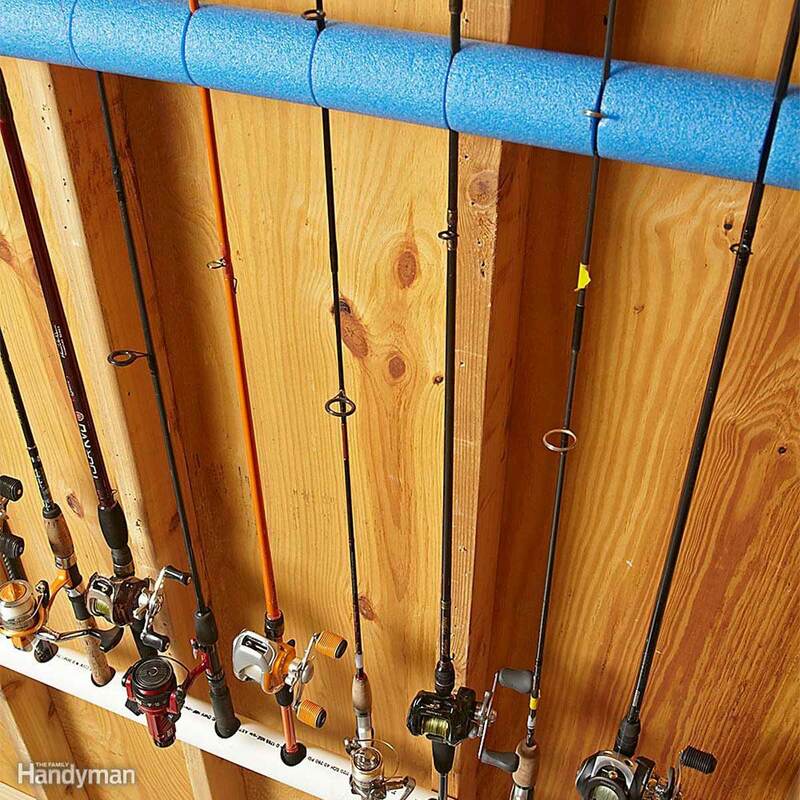 Of course, sometimes a few hooks just aren’t enough to keep everything organized so a different DIY garage storage idea is needed. These storage shelves featured on mylove2create seem like a good option. Be sure to follow the tutorial’s instructions to ensure the success of your project. Sometimes a garage can be too messy and badly organized to even know what to focus on. In that case, a total makeover might be a good idea. You can check out the transformation featured on pinklittlenotebook as a source of inspiration. 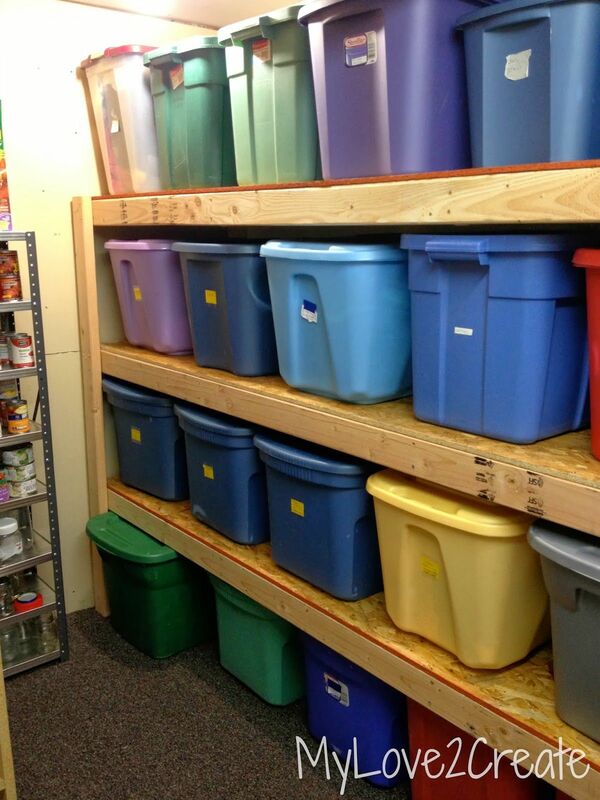 It shows how much of a difference some fresh paint and a good storage system can make. 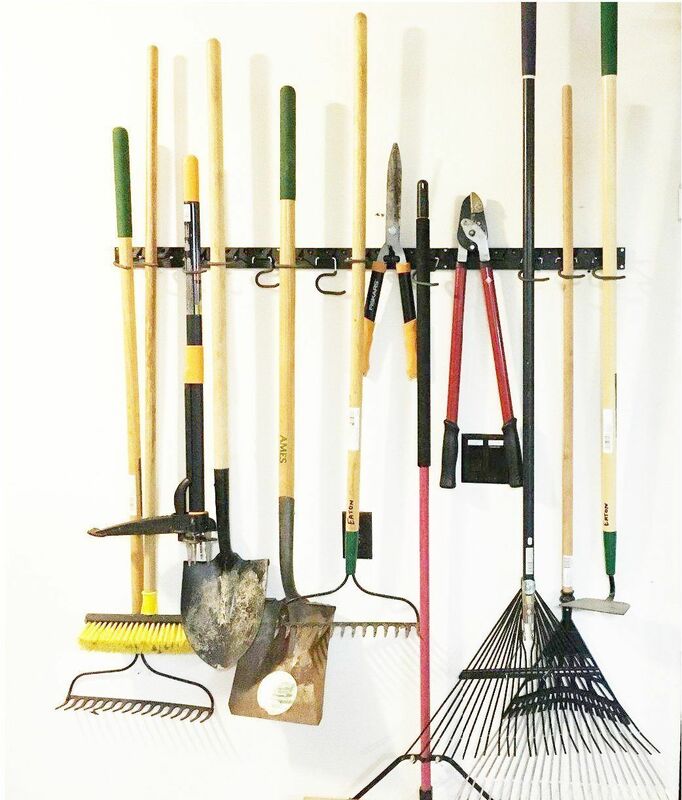 Large gardening tools can take up a lot of space, especially if you don’t have a designated storage system for them and you just pile them up in a corner. The good news is you can easily remedy that with a simple project that involves an old wooden pallet. Find all the details on hometalk. Simple shelving, as it turns out, can be the perfect solution to the storage problem a lot of us have in spaces like the garage or the storage room. If the ceiling is low like in the case of this basement space featured on hometalk, the shelves can go all the way up. It’s great having a garage where you can store your bike or scooter and a bike rack would come in handy too. You can build one yourself out of wood and you can customize it to hold not just bikes but also scooters and other things. Check out Hertoolbelt for more details. A garage is often also a workshop and if you often do projects in here then you might want to take some time one day to build a workbench with storage underneath. The unit would be quite similar to a kitchen cabinet or island. 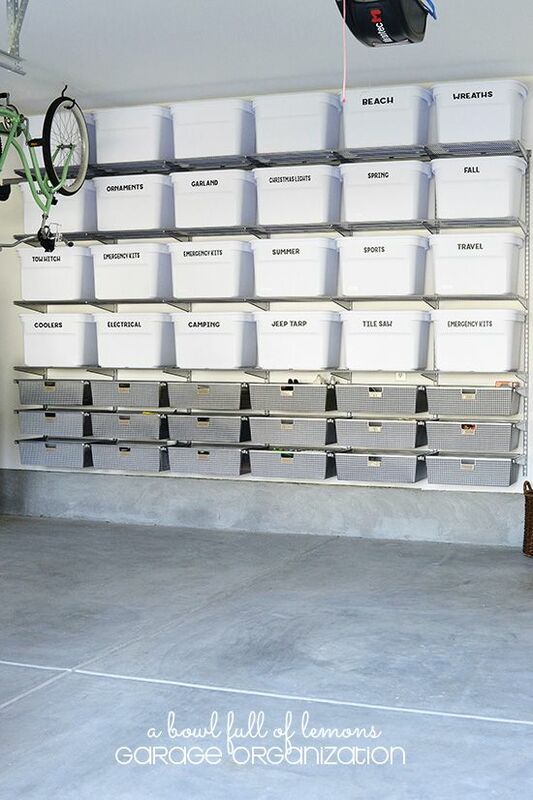 Don’t forget to maximize storage with wall-mounted garage organization systems like those featured n hometalk. 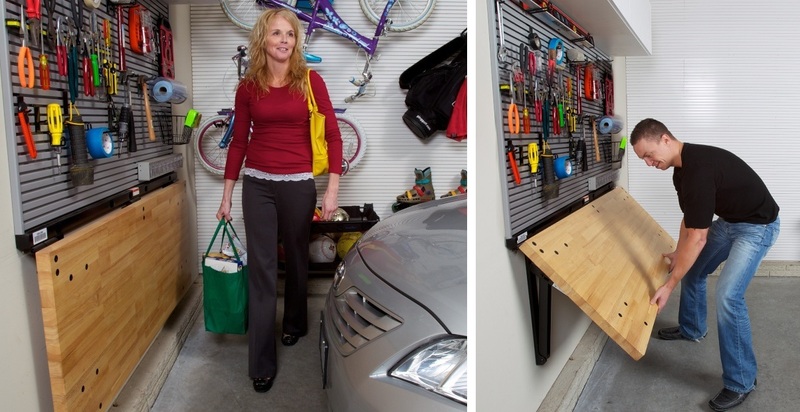 No more room for storage on the floor or the walls of your garage? Look up and build yourself an overhead shelf. You can use reclaimed wood or pallets for this project. Customize the design based on your own specific storage needs. You can find a detailed tutorial for this on instructables. Open shelves are often the best storage solution, especially for pantries or garage spaces. 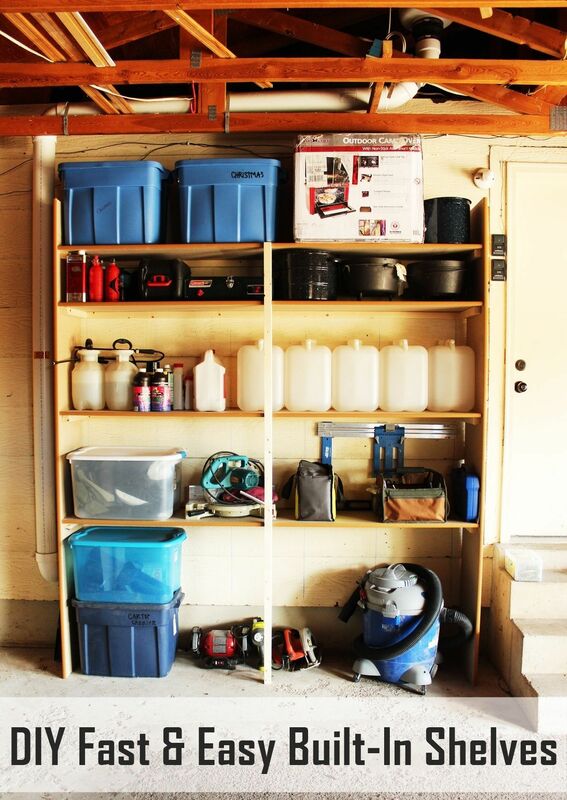 Building custom floating shelves for the garage is pretty easy according to this tutorial from instructables but keep in mind that you can customize the project according to what you plan on storing there. For example, you can space out the shelves so they can accomodate large objects if that’s the case. VERY INTERERSTING THIS is costing us £300 a year in home repairs – but is it a price worth paying? When building garage cabinets or storage units, it’s a good idea to include as many storage options as possible and to avoid only having open shelves or only drawers. 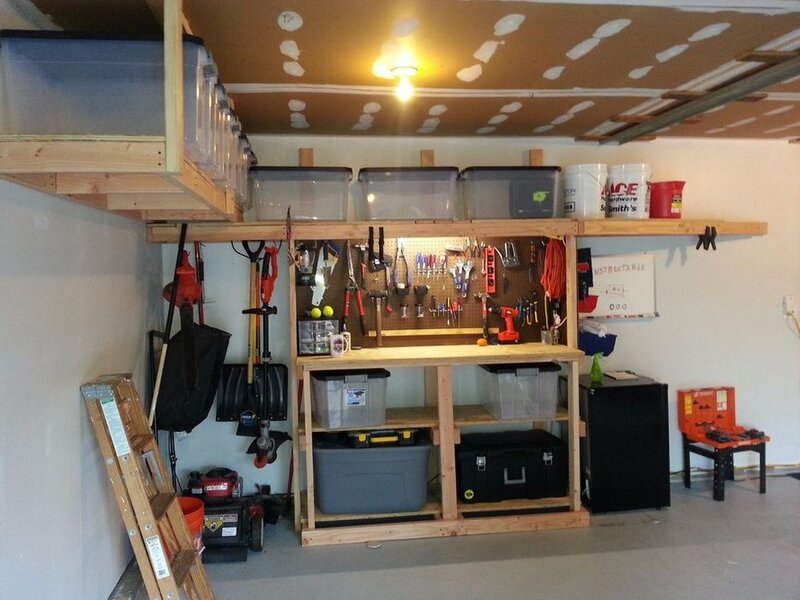 This way you can better organize the garage and you have more options to choose from. A nice example is this instructables workbench design. 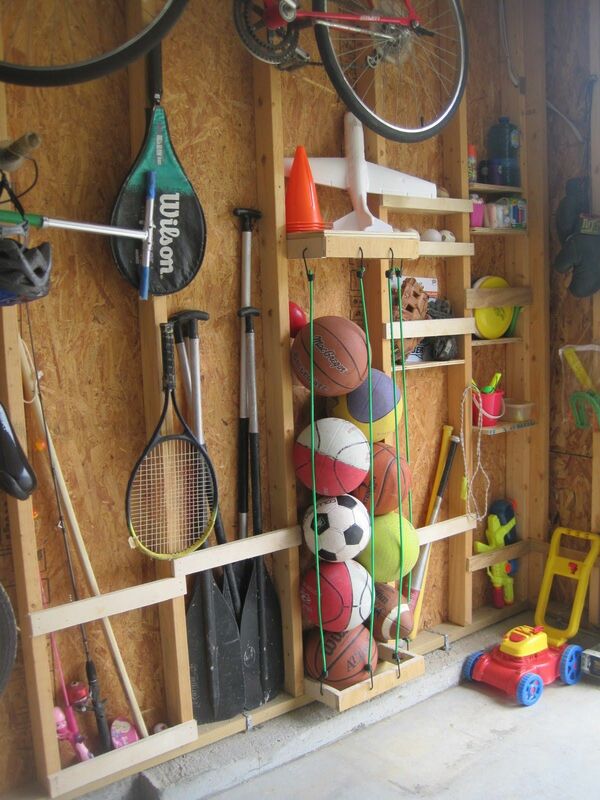 It’s also useful to have some flexibility and mobility so you can either reorganize the garage if need be or so you can move around a storage module if for example you have a project that needs to be done outdoor or in a different location. This portable storage caddy from Mom4real would be perfect for those situations. It’s not just the big storage units and garage storage systems that can make your life easier but also the accessories and the small things like a homemade extension cord winder. You can learn how to build one by following the tutorial offered on instructables. Speaking of little things and accessories, this zip tie organization system is pure genius. It’s quite easy to put together too. You just need some PVC pipes, a piece of wood and a few nuts and washers. Never mix up your zip ties and always know where to look for them when you need one. Find more details on instructables. In case you have some old furniture you don’t need anymore, don’t be quick to throw it away just yet because you might be able to repurpose it. For example, an old cabinet could become a storage unit for the garage and you could keep garden tools and other things in it. 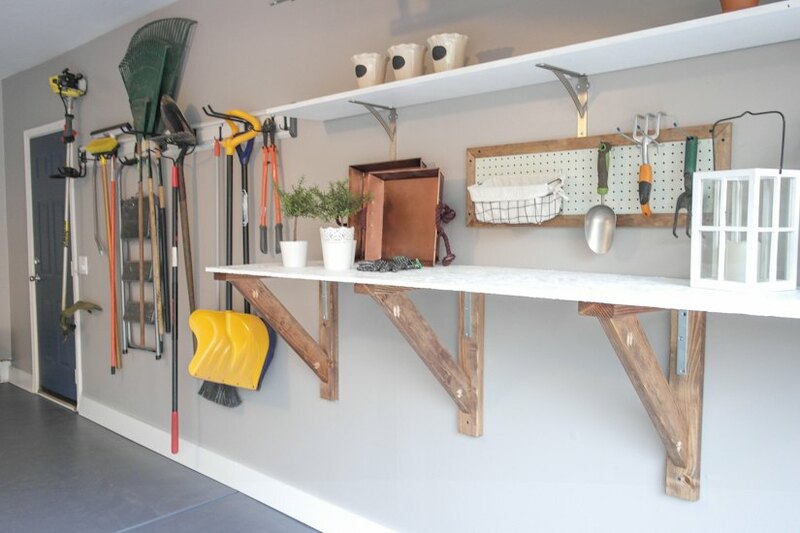 If you can find yourself a metal rack and some reclaimed wood then you have a recipe for success because you can use these things to build a garage organization system with shelves on which you can keep tools, gardening supplies and all sorts of other things which you can separate into containers. Check out funkyjunkinteriors to find an inspirational project that describes this process. 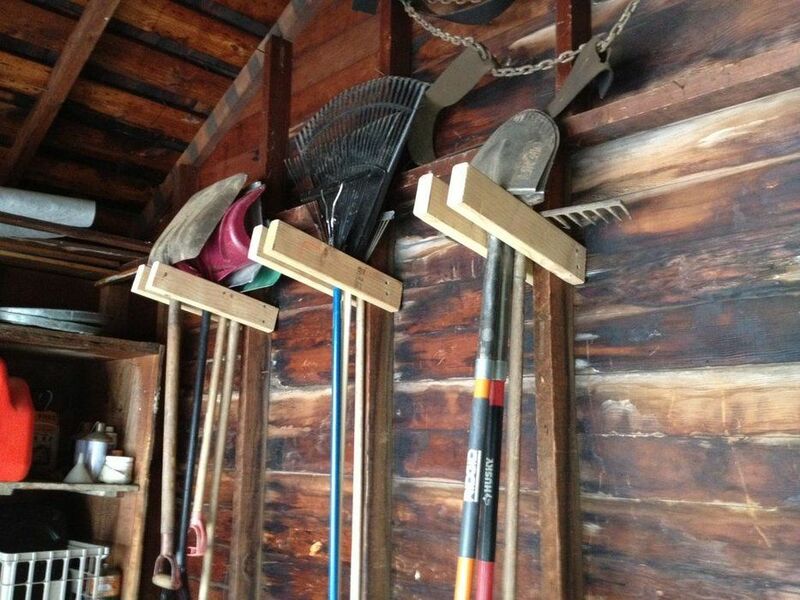 Finding a good way to store tools like brooms, gardening rakes and other things with long handles is close to impossible and yet there are solutions, like the one suggested on newlywoodwards which could definitely save your garage from becoming a messy and ugly space. It’s not just the actual storage system that matters but also the way in which you customize it and make it work for you and your own garage. For example, a basic shelving unit might not look like much but check out how cool and well-organized everything looks on abowlfulloflemons. It’s all done with containers and labels. There’s also a bunch of easy changes that you can make to your existing garage space and the furniture in it in order to make everything more storage-efficient and user-friendly. 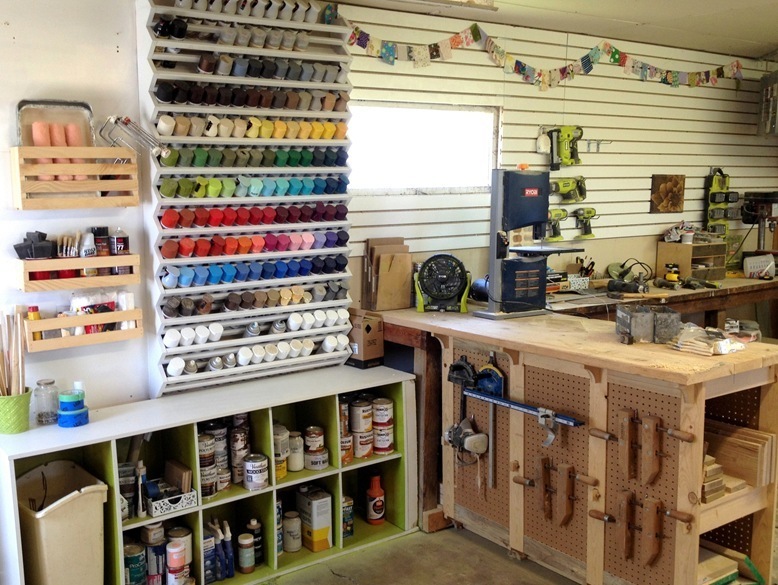 For example, a great idea is shared on benchsolutions and suggests removing the legs on the garage workbench and attaching it to the wall instead, creating a fold-down table. Those shoe storage systems with pockets can be very useful in the garage, for organization purposes. One option is to hang one of these things on a wall or on the back of a door and to use the pockets to store and to organize spray paints or other supplies. Isn’t it better than keeping everything in a box or on a shelf? The idea comes from hisugarplumsblog. 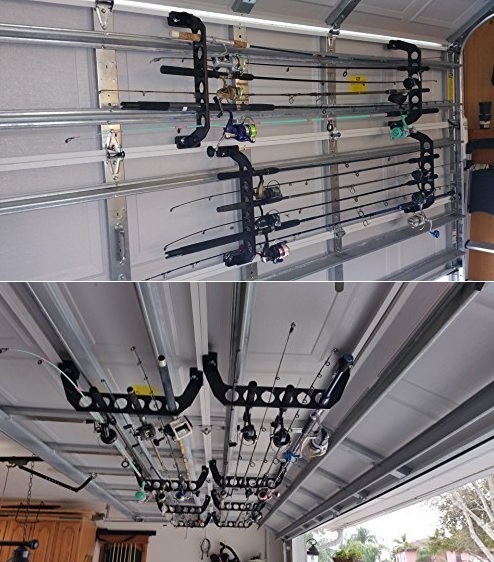 If you have an extension ladder or some fishing rods in your garage then you’re aware of how difficult and annoying storing these things can be. Luckily we found the perfect DIY garage storage ideas that actually work. Check out familyhandyman to find out all the details. We’ll give you a hint: you’ll be using the ceiling. We really like the idea of having dedicated storage spaces for everything so naturally we find this organization system from abeautifulmess to be simply great. The idea here is to use wall-mounted hooks and containers to create a custom storage system and to group up objects in a way that suits your specific needs. 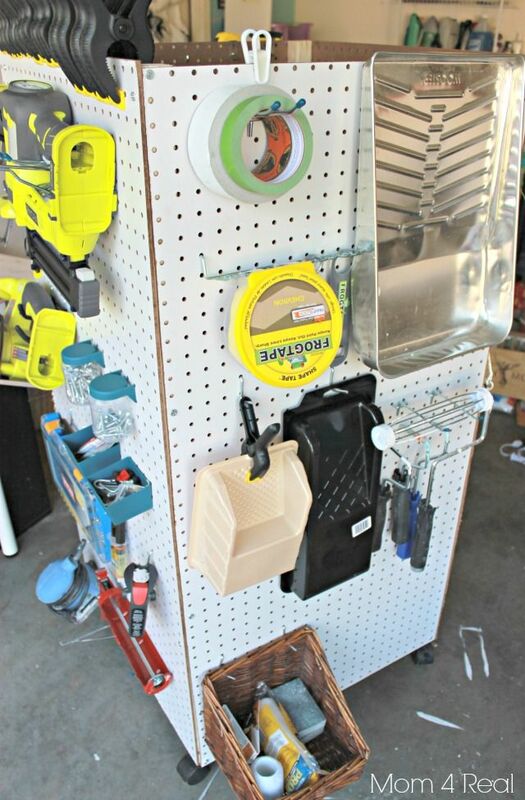 Speaking of garage storage systems that let you group up objects to save space and to make everything more user-friendly, there’s also this idea from instructables that you might like to implement. These tool hangers are super easy to put together and they make a big difference in the garage once you have them. Of course, mobility is also important and you may find it more practical to store some of your tools in a rolling cart rather than on a wall. 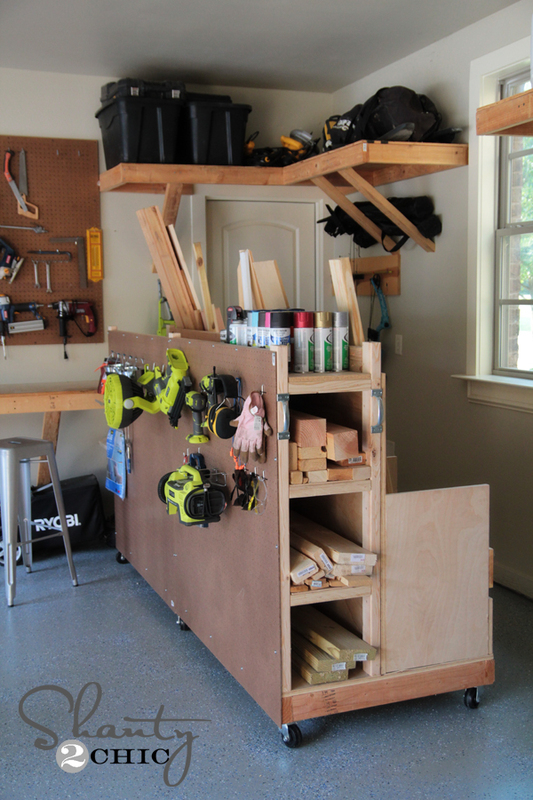 If that’s something that appeals to you, check out this cool organizer cart from instructables. It’s great for things like brooms, rakes, shovels and other tools with long handles. 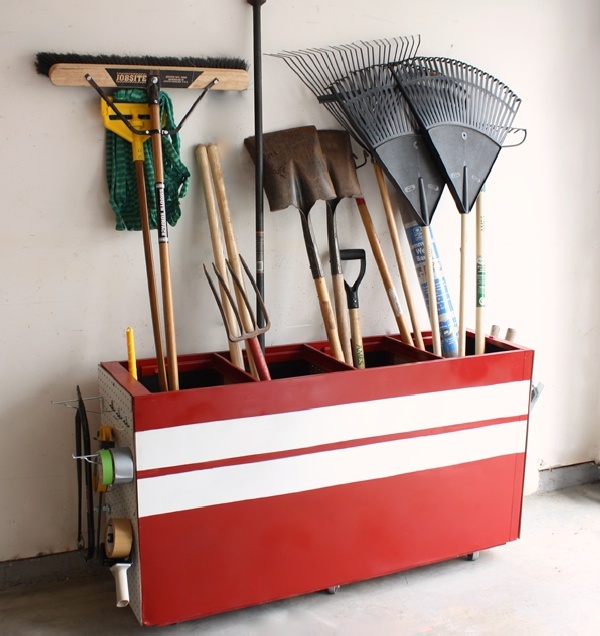 Sure, tool boxes are great if you’re looking for a way to transport everything you need to a different location but if you’re working in your garage a more practical and user-friendly idea would be to have everything stored and organized on a wall. You can build the rack yourself by following the instructions on popularwoodworking. 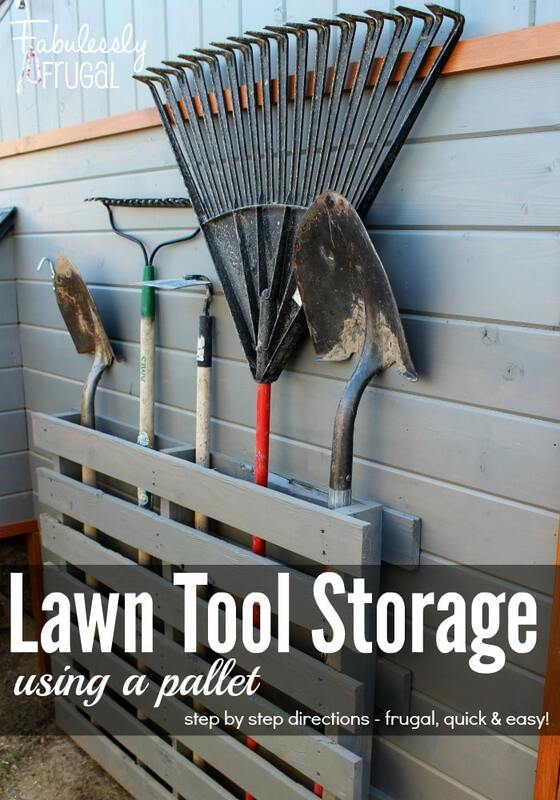 You may find it more practical to store your garden tools in a horizontal rack and that makes sense in a way. Such a storage rack wouldn’t be difficult to build in any way. You can mount it with screws onto the wall of your garage or shed. Find more details about this project on instructables. 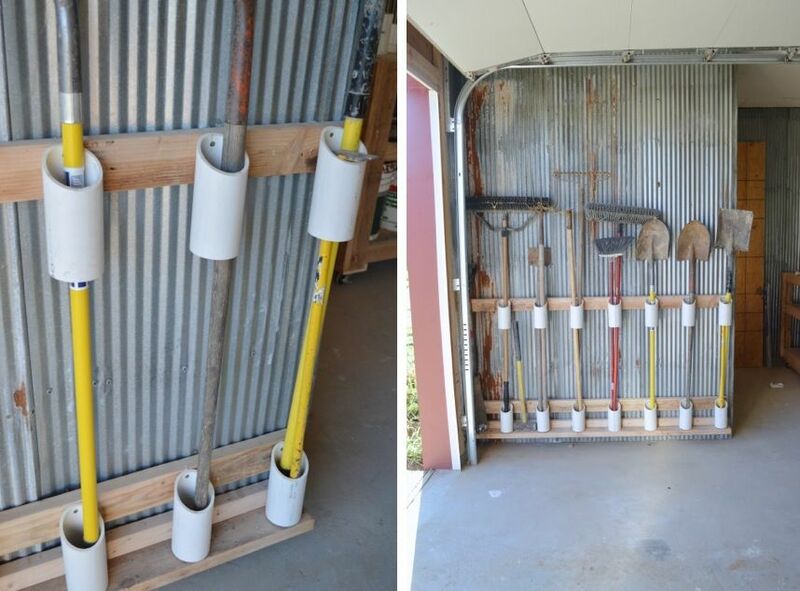 A pallet can also easily become a tool storage system and the modifications you have to make are minimal. You might want to remove a few of the boards or add some dividers inside the rack. Also, you can stain or paint the pallet to make it more presentable. In any case, the project would be fairly simple and you can find all the details about it on fabulesslyfrugal. 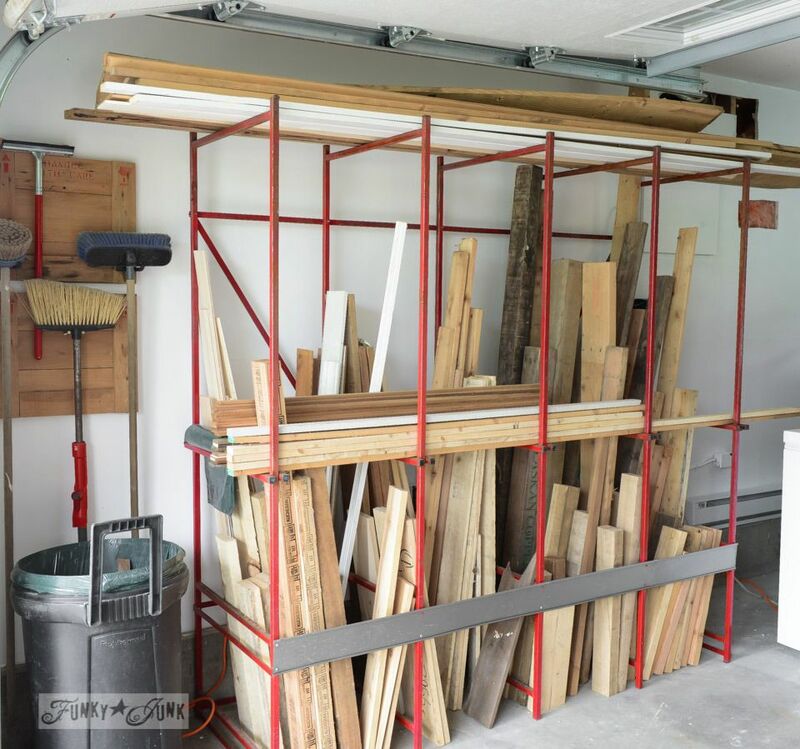 Before you make a decision regarding what garage organization ideas you’re going to use, take some time to look at the contents of your garage and to come up with a custom solution. A complete remodel of the garage is a big project and you have to consider all the details. Perhaps this project featured on designedtodwell can be of some use and give you some inspiration. Another project that shows how important customization is can be found on realitydaydream. 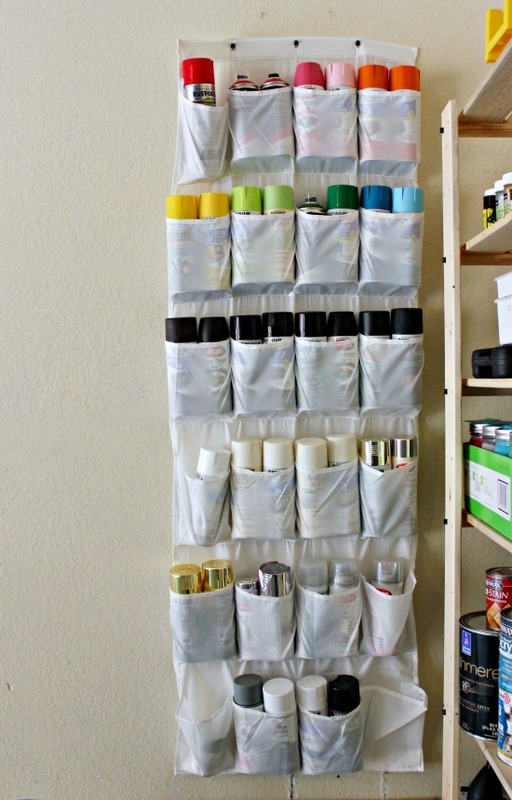 This would be the perfect DIY storage system for you if you have a lot of spray paint cans in your garage. You can organize them by color or type. You may need a smaller rack if your collection is not as big as this one. 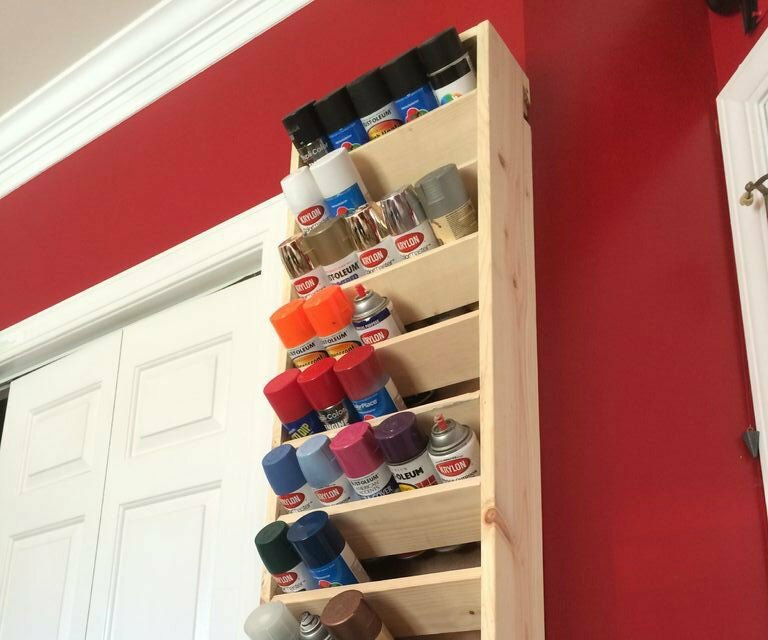 Speaking of spray paint racks, check out this smaller version featured on instructables. You can make it out of some reclaimed wood, perhaps from a pallet and you can mount it onto a wall in your garage. It’s useful not just for spray paint cans but also for other things that fit in there, like jars or certain tools perhaps. 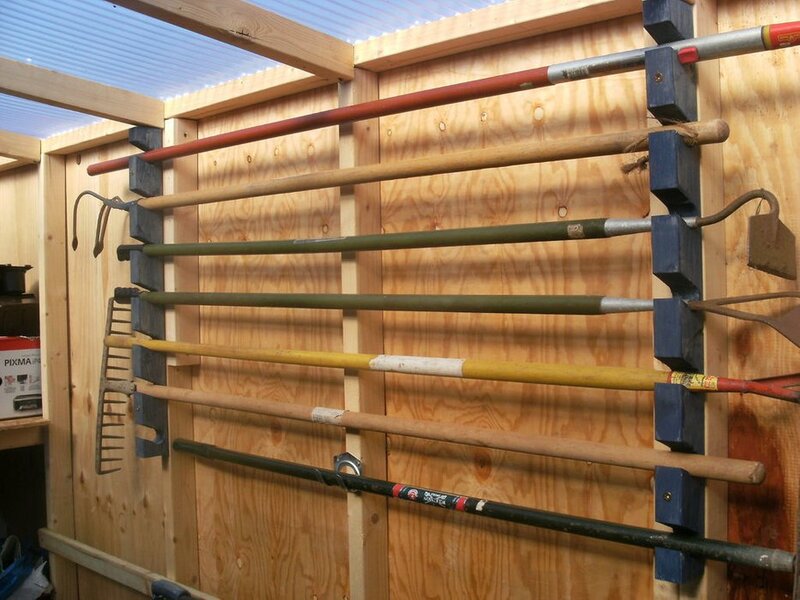 We’ve talked about all sorts of garage organization systems for tools, supplies and other things but we didn’t really think about the case where you have some lumber that needs to be stored in there too. It’s a valid option for anyone who enjoys crafting things every now and then. 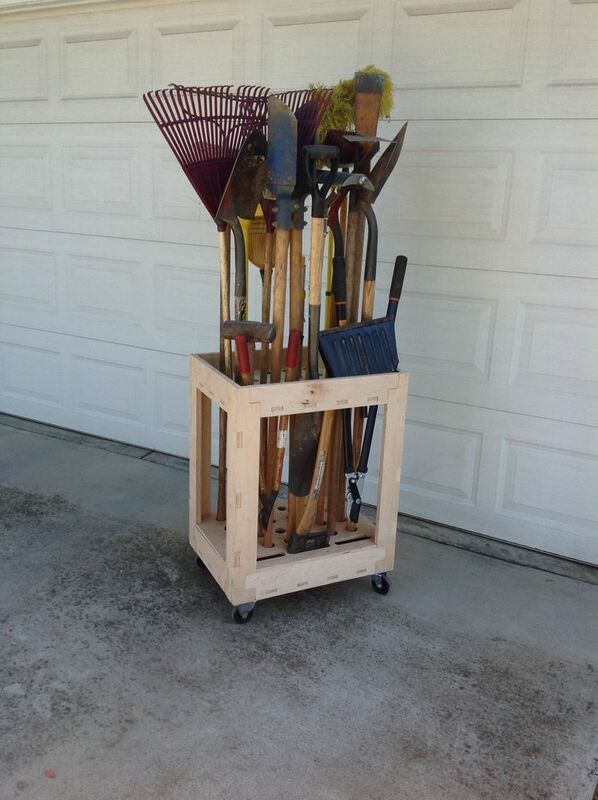 If you’re a DIYer too, you might find this lumber cart tutorial from shanty-2-chic quite useful. 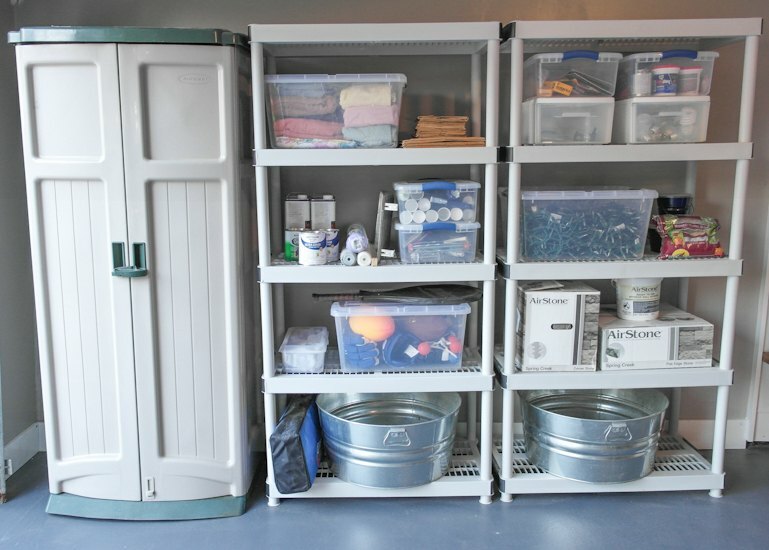 Of course, there are plenty of garage storage and organization systems that you can buy and that can save you quite a bit of time and effort. 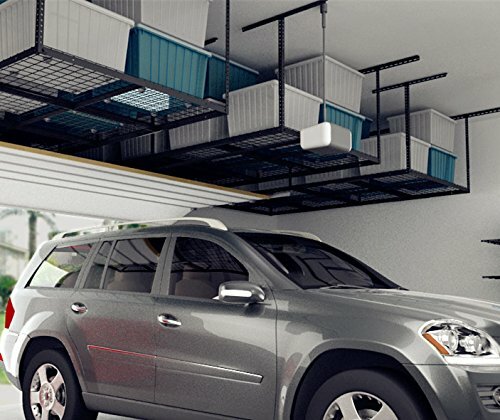 We’ll have a quick look at some of them right now starting with this overhead garage storage rack which can be installed onto the ceiling and which offers lots of storage space for things you rarely use but still want to keep. 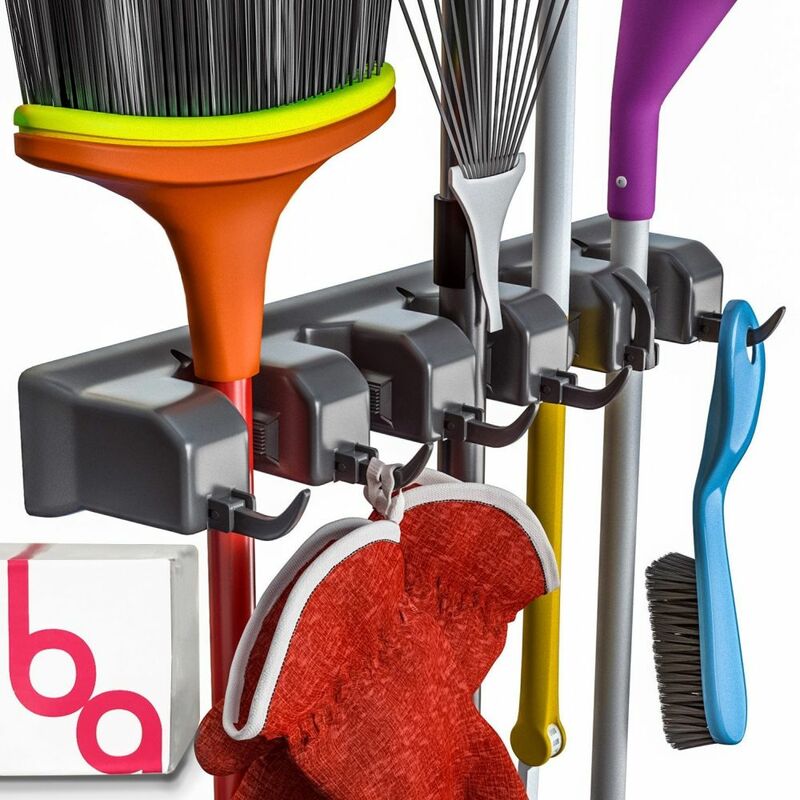 For all your mops, brooms and garden rakes you could get the Berry Ave Organizer which has five slots and six hooks and which is super easy to install. The rubber pads hold the handles and prevent slipping and the hooks are great for hanging gloves and other small things, allowing you to group all your tools in one place. 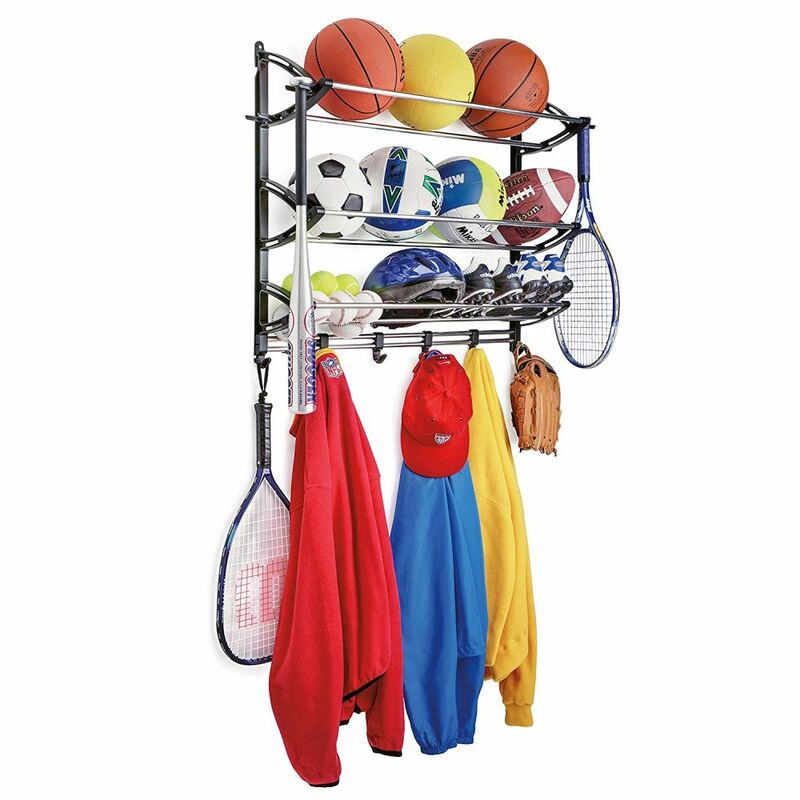 For sports gear and equipment you might want to get a Lynk Sports Rack which can hold footballs, basketballs, helmets, shoes, jackets and just about anything else all in one place It has shelves and adjustable hooks and it’s easy to install. The Fitool adjustable storage system is great for garage spaces, sheds, basements, workshops but also closets. Use it to store and to organize tools like rakes, brooms, shovels, hedge sheers and other things using the multipurpose hooks. 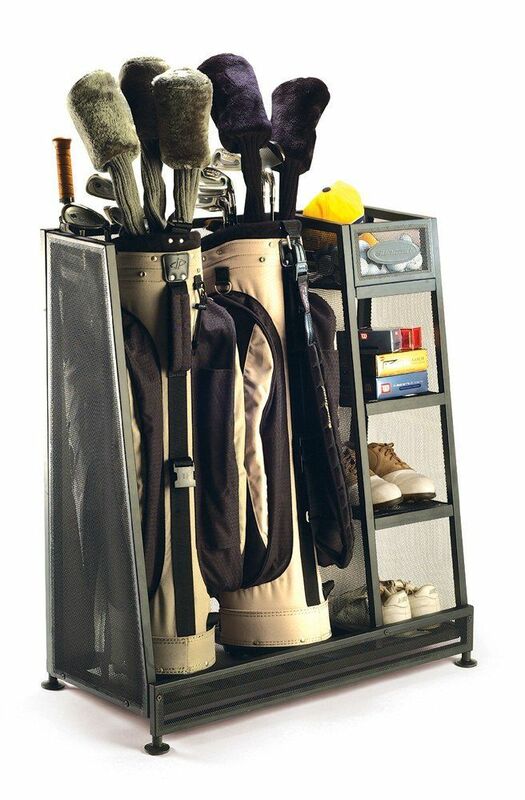 Here’s another organization system you might find useful: the Suncast golf organizer which is a compact module that can hold all of your golf equipment including clubs, shoes, balls, gloves and other things. It’s made of sturdy metal and it has adjustable feet. You can maximize the storage capability of your garage by installing racks and shelves on the walls and even on the ceiling but there’s one surface that usually remains empty: the garage door. With the Cobra storage system you can now store things on the back of the garage door as well. You can also install it on walls and ceilings. 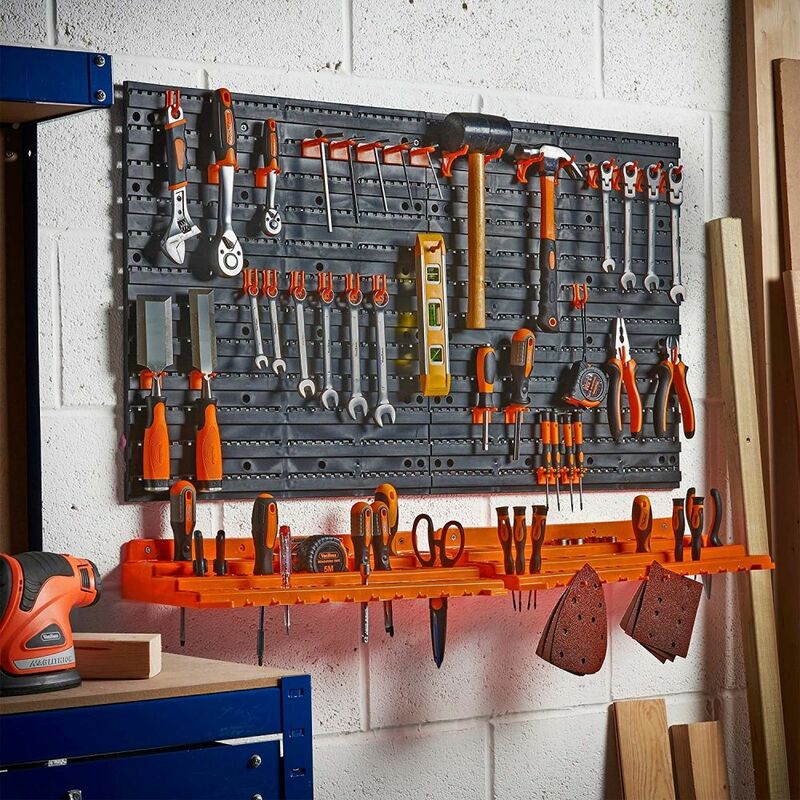 A pegboard tool organizer would be simply perfect for the garage and we have one in mind which can probably hold all of your basic tools (or at least 50 of them). 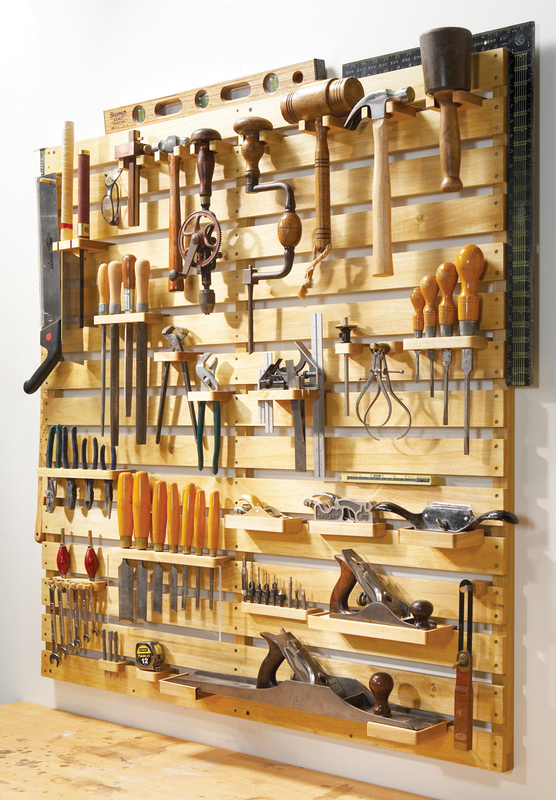 This is the VonHaus pegboard organizer, a versatile and modular system which you can attach to any wall. 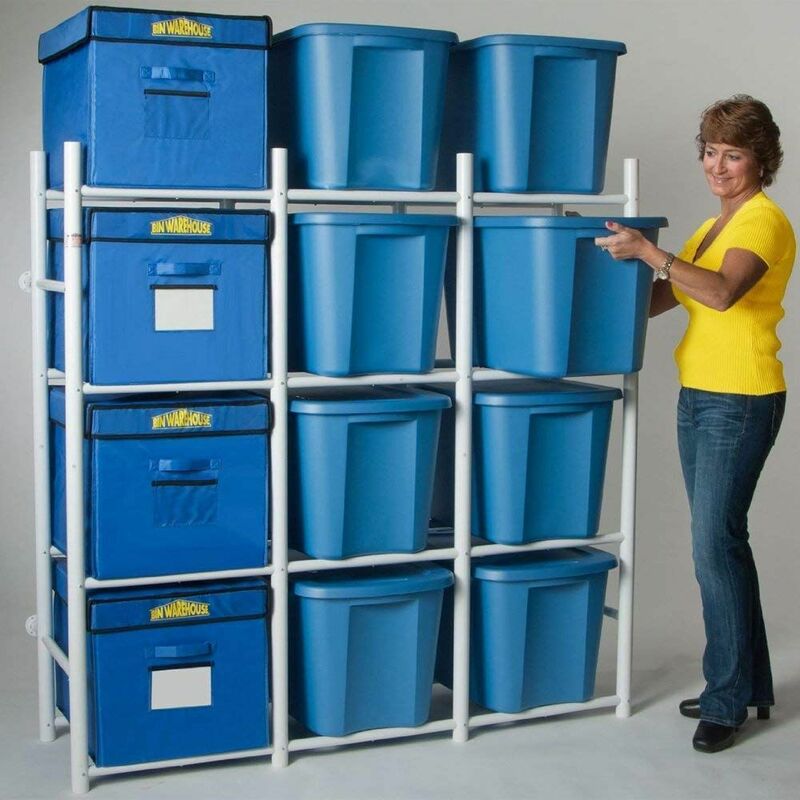 Packing everything in large containers or boxes and storing it this way is a practical idea and the Bin Warehouse storage system can help you make it all easier. It can hold 12 storage bins which slide in and out for easy access. The system is great for garages, basements or closets. 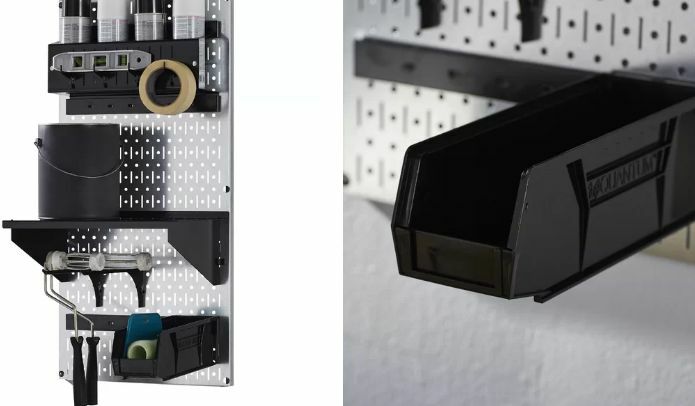 Featuring an assortment of storage hooks, hangers and shelves, the Wayfair Basics pegboard organizer kit lets you store things like brushes, paint rollers, masking tape, paint cans and other items neatly and all grouped up so you always know where to find them when you enter your garage. It’s made of galvanized steel. 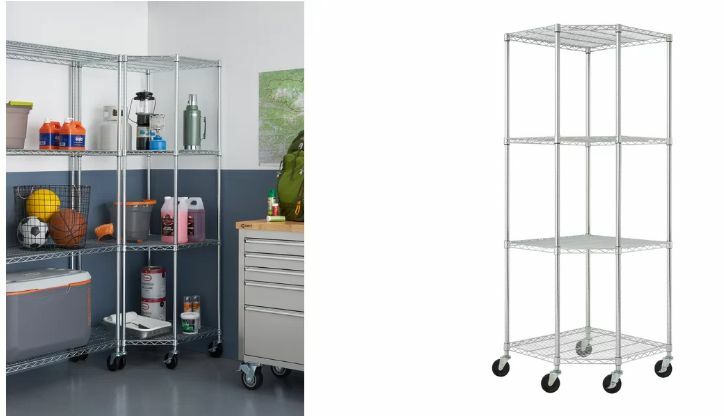 Great for corner spaces, the NFS shelving unit organizer has wheels so you can easily move it around and can be used in a lot of different settings and for the storage of all sorts of things like tools, boxes, etc. You can use it in the pantry, the kitchen or the garage and you can combine it with other modules to create a custom storage unit. 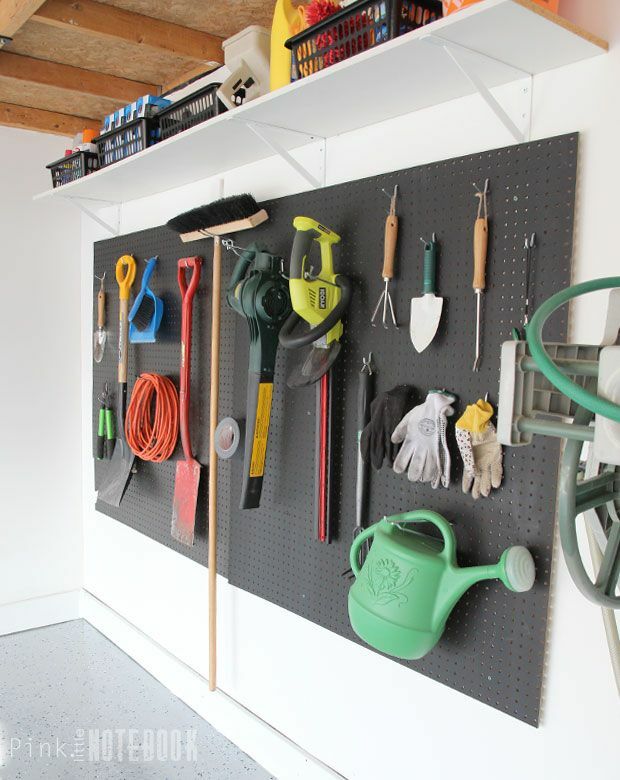 The last garage organization idea on our list has to do with tools. 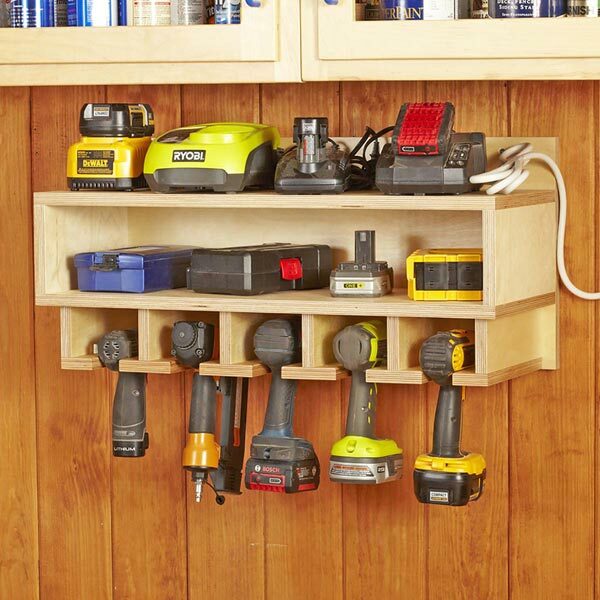 Check out this Cordless Tool Station which lets you store things like drills, nailers and other tools, each in its own module, easy to grab and close at hand. There are also shelves for storing boxes, batteries and other things on. The post The Most Popular Garage Organization Systems And How To Build Them appeared first on Home Decorating Trends – Homedit.